or order from Four Way Books here. 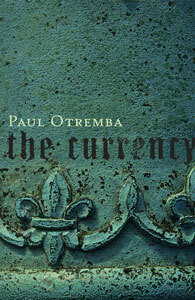 Reckoning with and making a reckoning of what it is to look at the world and try to understand it, Paul Otremba’s evocative debut, The Currency, investigates the intricacies of human emotion and sensation. With John Keats and the Greek philosopher Gorgias as tutelary spirits, The Currency holds what is current—what is both moving and present—to the light and revolves it, displaying its shades and shadows.